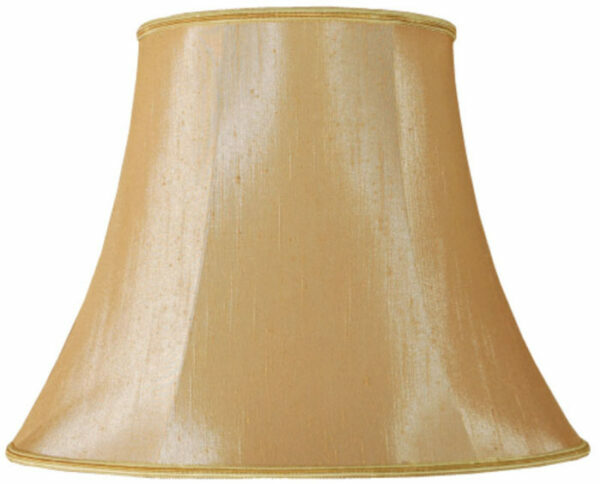 A champagne colour 5 inch bowed Empire clip on lamp shade suitable for wall lights or chandeliers. Part of a matching range of classic lamp shades, with contrasting edging in a range of sizes from 5 – 22 inches. Simply clips onto a standard candle style lamp in seconds. Fully lined and made in champagne faux silk fabric with matching trim. The 5 inch shade is the perfect size shade for use with wall lights or chandeliers. Height 4.75 inches. Please could you advise whether this shade is designed to fit a GLS bulb or a candle bulb. Hello Martin, the clip on this shade is designed to fit a candle lamp, thank you.